Walk along the esplanade near the Sydney Opera House. It's imperative we are clear and concise when we provide travel suggestions. When our reader Susan wrote the following in an email today we felt it was necessary to clarify our phone situation which may be unclear, especially to newer readers. in various countries as we travel." The answer to this query is multi layered so please bear with us as we respond to this important question. Oh...the name of a clothing store in Sydney. Short term travelers such as those traveling for a week or two, nothing is necessary regarding your use of a cell phone providing you contact your carrier as to the cost of roaming fees. If you limit your calls to short talk time, you may not incur huge roaming fees. However, if you plan to talk to family and friends back home, your best solution is to use Skype or another free face time service. If you use your cell phone's data, which is necessary to make the Skype call, you may incur your home provider's outrageous roaming data charges. Its best to check before you travel. If you'd like to purchase a SIM card to install into an unlocked phone, you may do so once you arrive in the new country which can be purchased at most conveniences stores, grocery stores and at cell phone stores. Tom in front of Sydney Opera House. Recently, we purchased a SIM card at the local Cole's grocery store. It didn't work in our Windows smart phone. I was shocked that Cole's gave us a full refund (via store credit) for the purchase even after we'd opened the package and activated the card. That's unusual. I wouldn't plan on this occurring in most cases. If this exceeds your level of knowledge of using SIM cars for your phone, simply go to a phone store in a local mall and they'll set it up for you providing you have an "unlocked" phone which is a one that allows a SIM card (or two) to be installed to work for calls and/or data. If you don't have an unlocked phone, your home provider usually will provide some options for roaming rates you can live with. Caution: don't take a risk and underestimate how quickly you can incur roaming charges. We've heard nightmarish stories of thousands of dollars in charges incurring over short periods. Optical illusion...ship is actually across the channel. 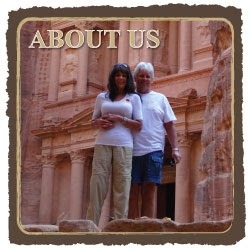 As a result, when we began traveling the world in 2012, we chose not to have a US provider. The roaming fees would simply be too costly if we could freely call family and friends at our leisure and...use data on the phones as we traveled; maps, games, searches for local venues, etc. Instead, we purchase SIM cards in locations where we may need to make local calls such as for taxis. Otherwise, we can use our Skype phone number which we purchased for US $5 a month providing us with a US number in our home state. 1. We can't send or receive texts. 2. We need a data connection to make the calls. Conveniently, the train station, ferry station, buses and taxis serve the same area in Cicrular Quay, Sydney. In 2015, when we entered Australia, we purchased a data hot spot (Wi-Fi device) which enables us to use data on our smart phone when we're out (my phone died and the new phone is in the missing package we're tracking at this time) thus we can use any type of communication apps with others who use such apps as "Whatsapp" and others. As to the answer to Susan's above inquiry; PayPal insisted they confirm my identity with a text received on my smart phone number. This didn't work for us. We can't receive texts with our current setup. In speaking with PayPal, they figured out a workaround and finally used a series of security questions as mentioned in a prior post thus enabling us to use the service as we had in the past. Apparently, PayPal had beefed up their security since the last time we'd used it several months ago. It should work well for us going forward. Since we never do bank transfers to pay strangers for holiday/vacation homes, we use PayPal, Stayz, AirBnB, etc. through their direct credit card payment processing. This provides us with a layer of security and resolution should we experience a "scam" rental which can easily occur. As the Manly Ferry pulls out of Wharf #3 at night. Continuing with the answer to Susan's question; yes, you can keep a stable number in one of your SIM card slots on an unlocked phone but keep in mind, you'll be paying roaming rates when you're out of the country where you purchased the card. This can add up quickly. The bottom line? Traveling the world means sacrifices and changes if you don't want to spend thousands of dollars a year in communication fees. We spend US $5 a month for our phone number, varying amounts for SIM cards in various countries and data charges as we go when applicable. For example, here in Fairlight/Manly, the house has good Wi-Fi. As a result, for any calls we've made, we've been able to use our US $5 a month phone number at very low hourly rates while we're online only. When out and about, we don't make calls and have decided not to purchase a SIM card here. The lowest price we've found is around US $30 which, since we don't make calls while out, there's no need to add a SIM card after all. Most cells phone will allow an "emergency" call without a SIM card. Verify this on your phone if you decide to go without a SIM card entirely. Always have a means of calling "911, 999" etc. for emergency situations. Tom's second meal at Searock, medium rare sirloin steak with mushroom sauce and chips. In Susan's case she could buy a local SIM card for the country she's visiting and have a "stable" SIM card in her home country to use at her discretion. No doubt, this is complicated. Perhaps, someday data and calling will become worldwide eliminating all this confusion and effort. For the regular short term traveler, this isn't complicated. Just don't spend hours talking on your phone or using social media or playing games, all of which use data and roaming fees. Use Skype to Skype for free calls to loved ones, using the "free" data you may have available at your hotel or holiday home for other purposes. With our Skype number we can call our family members cell phones while they're away from their computers. We use data and "minutes" calling them. They only use their usual "minutes" n speaking with us. Its very easy when we're using "free" data. All other "face time" apps require use of data. Please consider this when calculating "away from home" conversations, texts and chats. My second salad on next day at Searock in Sydney had more chicken which was less overcooked. Feel free to contact us with any questions but we suggest that you first call your provider for your roaming options which may provide exactly what you'll need. For world travelers, it important to consider the long term costs. For us, with a strict budget and lengthy period of travel, we don't use Twitter, SnapChat, Instragram etc. all of which would incur a cost we may choose not to incur while out and about. Hopefully, our daily posts are ample communication for our readers and the use of our Skype phone number fulfills the needs of our family members and friends. I hope this answers Susan's questions. May all of our readers have a lovely day! Ingredients we posted one year ago that we use for making homemade toothpaste. Click here for recipe and details.